Your perfect smile can be easily achieved through gum and tooth contouring. Some smiles are perfect but most need a little help in achieving their true beauty. This is never more common than when it comes to teeth that are partially hidden by excess gum tissue. Although we don’t often think about it, gum tissue is like the matting around a picture and can directly affect the size, length, appearance and shape of the teeth. In these cases, gum contouring (also known as gum reshaping) is a procedure that reduces or changes the gum line and exposes more of the natural teeth. 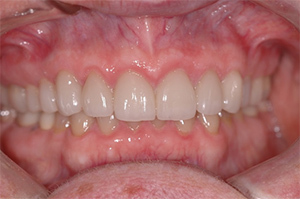 Suddenly, what is commonly referred to as a “gummy smile” becomes a more beautiful, confident smile. When your teeth are hidden by a low or uneven gum line, a gum contouring procedure can be utilized to reveal more of the tooth structure beneath the excess gum tissue. 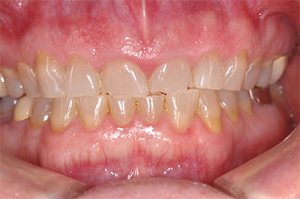 The benefits of reducing the appearance of a gummy smile are numerous, and the results are immediate and long lasting. Overall, a gum contouring procedure is an amazing cosmetic dentistry option for those who wish to reduce the appearance of excess gum tissue. In addition, a tooth contouring procedure can also be performed to help shape the teeth and improve the aesthetics of your smile. At the office of Dr. Otten, our cosmetic dentist in Lawrence is always ready to consult with patients about their teeth and gums, and we’re happy to help them create more beautiful smiles. Ready to learn more? Our extensive knowledge of cosmetic dentistry and tooth or gum contouring allows us to provide a world-class level of care to our patients in the Lawrence, KS area. Contact the office of Dr. James Otten at (785) 843-6404 for more information or simply fill out the form to request an appointment.